This post is for the hands on tester looking to practice their unit checking skills. Unit checks are good. They play an important role in your regression suite. Online tutorials of Python unit checks invariably leave me wanting more. The examples covered are extremely basic. Further, these basic tutorials miss one key step in learning unit checking – the ability to read code written by somebody else. This problem ends with this post. I take an open source Python application, read through the code and put in a unit check for one method. At the end of this tutorial, you will have learnt about mocking objects and patch decorators. Bonus: You will have a real application to practice your unit checking. Download the Python Chess app. You may also need to download and install pygame for your corresponding Python version. Pygame lets you run the application. The application we have chosen is small enough for you to look at the different classes and what they do. For this post, we are choosing to write a unit check for the IsCheckmate method in ChessRules class. Open up ChessRules.py in your favorite editor and read through the IsCheckmate method. We will check whether the GetListOfValidMoves method is getting called with the arguments that we expect it to be called with. The method IsCheckmate is working correctly as it is calling GetListOfValidMoves with the right arguments. Bugs in GetListOfValidMoves will be caught by unit checks written for GetListOfValidMoves. Note that for this blog post we have chosen to write one among a large number of possible unit checks for the IsCheckmate method. We chose this particular check because it illustrates multiple key concepts: mocking objects, patching methods, reading and understanding code. You can patch a method by calling the @mock.patch decorator. You can then access this patched object via the argument mockGetListOfValidMoves. NOTE: ChessBoard(0) initializes the chessboard to the initial position. By reading through the IsCheckmate method, we expect GetListOfValidMoves to be called sixteen times with every black piece on the board for the chess position we are passing it. Here is the final script you need. Please place it in the same directory as where you have ChessRules.py and ChessBoard.py. "Class to unit check the IsCheckmate method of ChessRules.py module"
"Unit test for ChessRules method: IsCheckmate"
# NOTE 2: We are NOT checking the setting color logic in this unit test. You need to write another unit test for this logic. And that’s it. You just ran a unit check on your Python application. Bonus: You now have a moderately complex application to practice your unit checking. 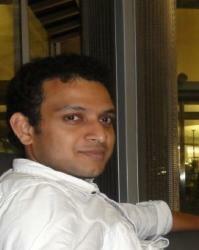 I am a software tester with over 10 years of experience in software testing. Currently I am working at Qxf2 Services Bangalore. As a student of the context-driven approach to software testing I feel there is a lot to learn out there which keeps me very excited. My work has helped me gain good experience in different areas of testing like CRM, Web, Mobile and Database testing. I have good knowledge of building test scripts using Automation tools like Selenium and Appium using Java and Python. Beside testing I am a “Sports Fanatic” and love watching and playing sports.